I recently got to test this Mazda CX-9 for the week and we took it to Castaway Bay overnight, 2.5 hours away and this CX-9 was a DREAM to Drive for our little road trip! The 2017 CX-9 averages 23 MPG, 20 city and 26 highway, this is decent for a full size SUV. I love the change Mazda made to their dashboard, BUT I dislike the dial, I really wish they'd do a touch screen. Bose speakers really amp up the sound! Built in sun shades in the middle! The CX-9 seats 7, 2 in front, 3 in middle and 2 in back. It is super easy getting passengers into the 3rd row. 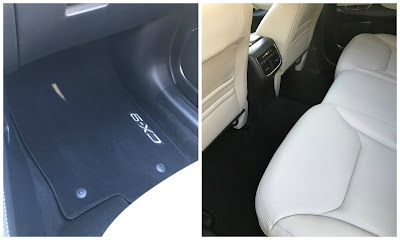 Just pull the handle on top of the seat and slide the seat forward. You can also pull the knob on the side and flip the seat down creating a flat surface. For our trip I had my 5 year old in a booster in this rear row, with 1 seat folded down (shown below), I had my 9yr old in the second row and my 3yr old in his convertible Diono in the 2nd row as well. Please take note, there is 1 top tether in the 3rd row and 2 in the 2nd row. Their 2015 model didn't have a top tether in the 3rd row at all. The ONLY LATCH is in the 2nd row, 3rd row does not offer latch. 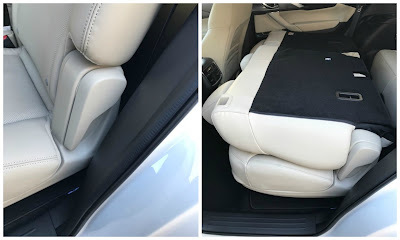 The trunk is a good size all around, on the left shows a bit of storage, and then the rear row does a 50/50 split fold to allow more room in the trunk. For our trip I had 1 child in the rear row and had the seats like this so our large rolling suitcase fit on the seat that was down. The Mazda CX-9 has some of my favorite features like the Blind Spot Monitoring, Rear Cross Traffic Alert and Rear Backup Sensors. It also has Dynamic Stability Control and Roll Stability Control, helps prevent wheelspin and helps you gain traction. Lane Departure Warning, Side Impact Door Beams and CHild Safety Rear Door Locks. The Mazda CX-9 has 4 models. Sport starting at $31,250. Touring starting at $35,970. Grand Touring (that I received) starting at $40,170 and the Signature starting at $44,015.